You may have to fill in points on a map in IELTS listening section2. This means you will be given a picture of a map to complete. When you must decide the answers to numbers on a map, the answer will come in order but that doesn’t mean it will be simple. Always prepare the map by looking at the locations of each number and predicting what language you might hear to find the answers. Make sure you check the title of the map to help you predict answers and language. Complete the map below using no more than two words for each question. Welcome to the Bedford Doctor’s Surgery. As you are a new patient, please listen to the information about our practice to learn about our surgery and the facilities available. To enter our surgery you will need to go up the stairs to the first floor so if you are disabled and need wheelchair access, you will need to call us to organize this. Once you enter the surgery, please go straight to the reception room on the left and sign in with our receptionist. You’ll also be able to wait for the doctor here. 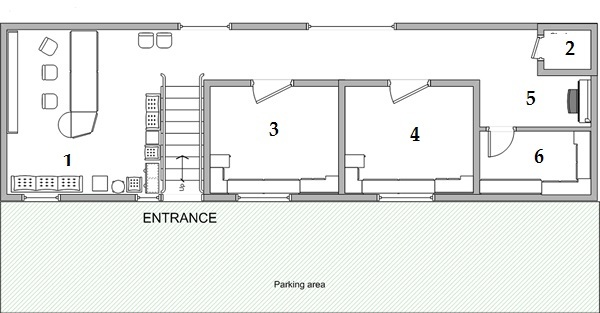 If you need the toilets, you’ll have to go back down to the ground floor which isn’t shown on the map and belong to the company renting that floor. If you have a large bag or a coat, you may want to leave them in the cloakroom which is located at the other end of the building. For the cloakroom, turn right once you get up the stairs and go straight ahead, it’s a small room at the end of the corridor. 3. surgery (directly right of the stairs – the speakers says two surgeries so this is for number 4 as well. The speaker said that one of them used to be a waiting room – this is in the past, not now – a typical IELTS trap). Thanks for your contribution in coaching IELTS aspirants. I am keen to understand the rationale for providing Transcripts at the bottom of the audio clip. I do not read these Transcripts and wish to check if I am missing some important learning tip/ technique by avoiding reading these? Of course you should study the transcript. Make a list of all paraphrases used, all keywords used in both questions and answers. Also use the transcript to read out loud to improve your pronunciation. cloakroom or cloak room or cloak-room are all these considered correct? or answer has to be cloakroom? First of all thank you so much for such an awesome blog. Your blog has helped me get a good score in IELTS. R 8.5, L 7, W 7, S 7. But I need 8 for listening and hopefully will make it in the next attempt. Once again thank you for your free lessons. Its the best blog I have read for IELTS. That’s a great score 🙂 Well done 🙂 I’ll keep my fingers crossed you can push your listening score higher. Start paying more attention to keywords in the question and transcript. Finally I have got my score card. I have made up my listening score. Its L 8.5, R 7, W 7, S 7.5. Thank you so much for your lessons and advices. Congratulations.. its an awesome score . I have been struggling to get 8 in listening attempted 2nd time and awaiting for results. Kindly share best practice / tips to get better bands in listening. Congratulations! Which letters did you use in reading and listening? Liz, first of all, thank you for offering all this material free for us. It has been helping me a lot! I just would like to make sure if I hear correctly. When you’re talking about the cloakroom I think you say: “If you have a large bag or a coat …”, don’t you? If so, I think there is a itty-bitty mistake in the script. But we have to change spain to spanish right? I am confuse and want to confirm the duration between question in listening section. to read question before listening . Please get the IELTS Cambridge Test books 1 to 10. They are real tests published by IELTS and will give you the length of time for preparing questions.